It was pushing 86 degrees this weekend, which meant it was time to chill with a few frozen daiquiris! In my opinion, this is the best part of the summer, relaxing on the deck, enjoying a frozen drink with my husband,... kids playing. I couldn't wait to enjoy the warm weather but when I stepped outside I realized the decor or lack of, just didn't match my mood......sooooo. 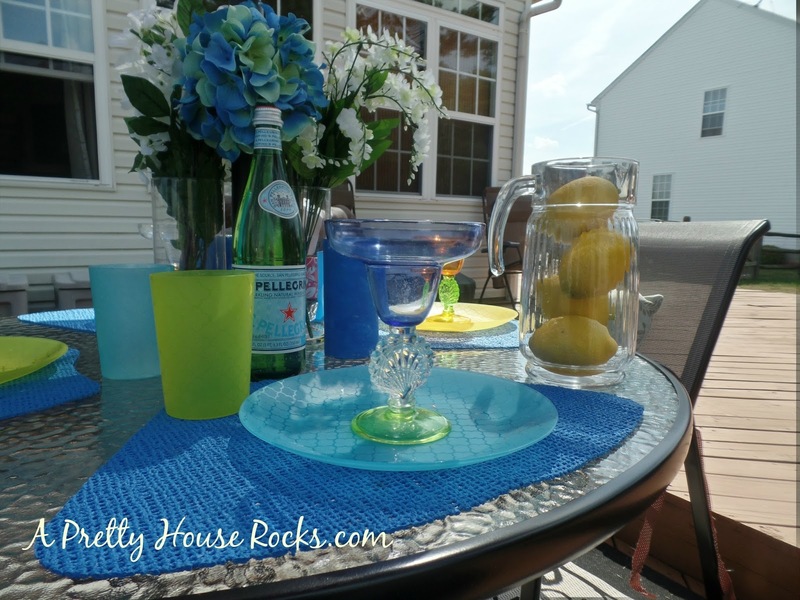 It was time to decorate my patio table and deck with some quick and easy decor. I didn't have time to plan I just wanted instant summer! Just enough to get the season started. Although...I still have a few ideas brewing in my head for the rest of the summer. 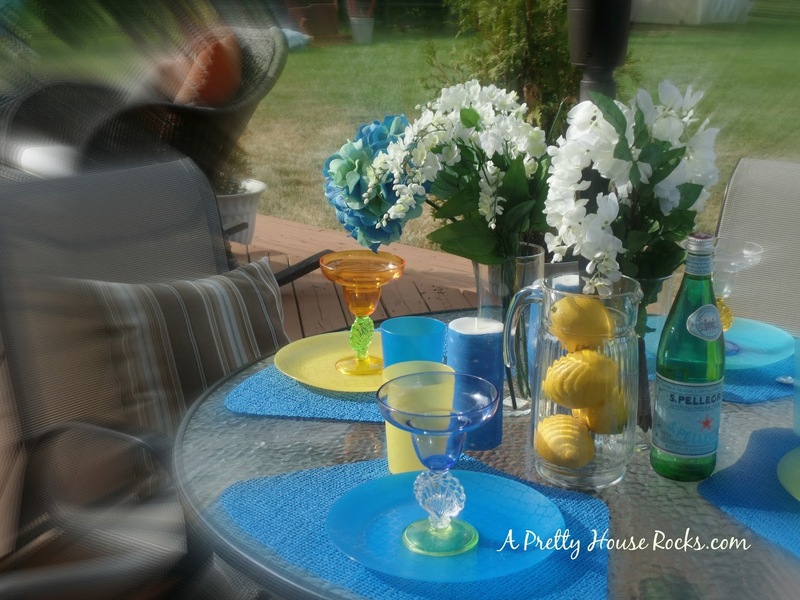 When I think of summer decor, I think of tropical themes and bright colors, so I simply filled my glass pitcher with lemons, to add some color to my patio table. We decided to have lunch outside, so I set the table with my favorite colorful margarita glasses that I've had for quite a few years. 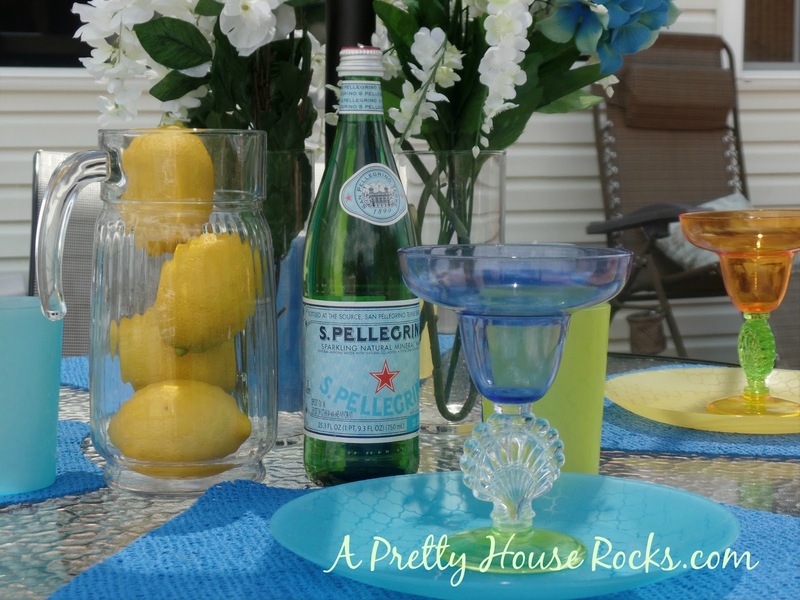 Added a bottle of S.Pellegrino sparkling natural mineral water....these bottles are always a stylish way to chic up any space. Flowers and colorful plates complete this table setting nicely. I found these plastic plates and cups from Kmart last week for practically nothing, they have a nice pattern on them and are perfect for quick but pretty table setting. Outdoor side tables need love too! 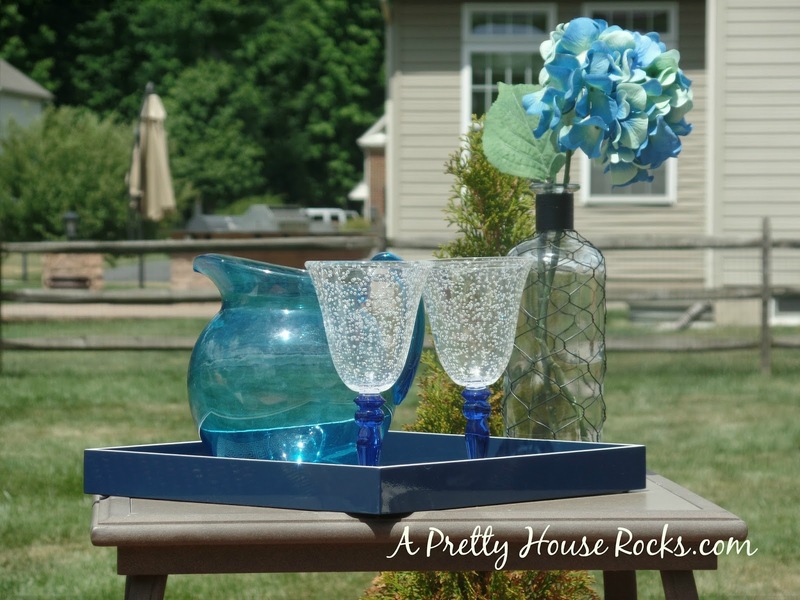 This blue pitcher on one of my outdoor side tables hasn't been filled yet...but it still looks pretty good! Well...that was a quick mood changer. 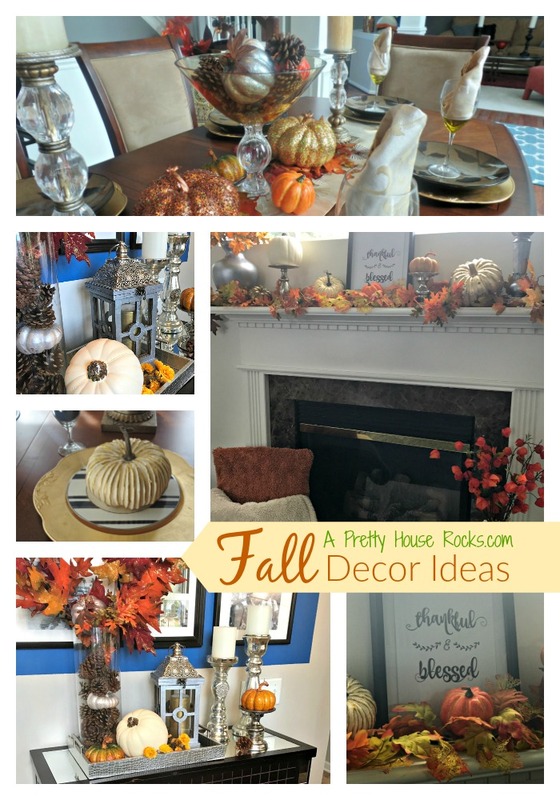 This was a quick and easy way to change this space, adding colorful items to brighten and change the decor. 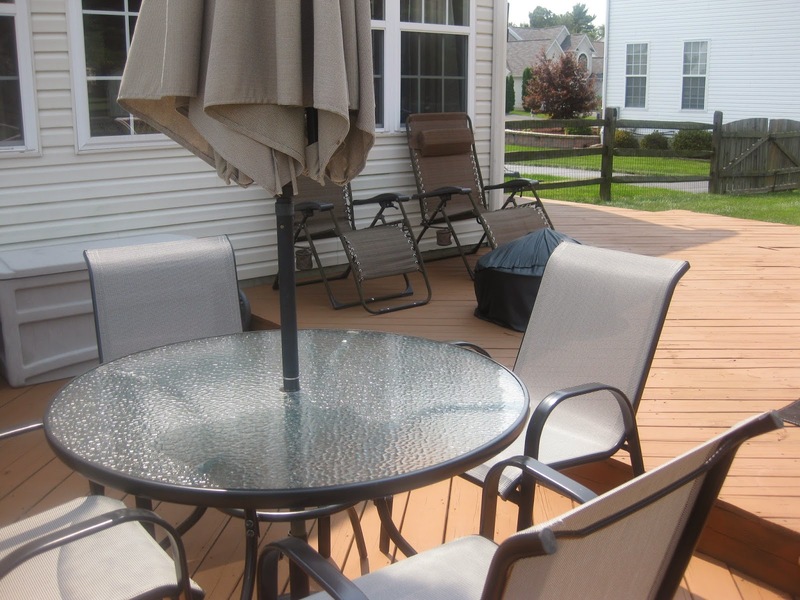 I hope these pictures inspire you to change the mood of your deck!